Background: The integration of sound and visual information is an essential component of cognition. It has been proved that sound and visual stimuli features play key roles in the audiovisual integration.With regard to the color perception in visual stimuli, there are two cone pathways: a red-green and a blue-yellow at the level of the retina and the lateral geniculate nucleus. However, the effects of two color pathways on the audiovisual integration remain unclear. Objective: This study focused on studying the effects of the red-green and blue-yellow pathway on audiovisual integration. 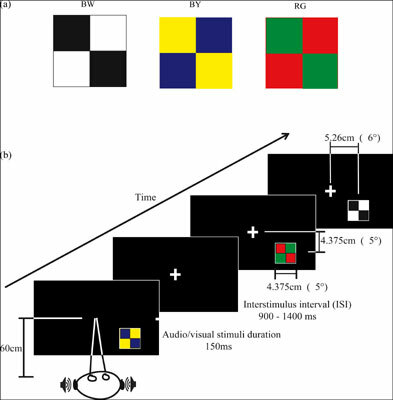 Methods: In this study, unimodal visual (three visual conditions: black-white, blue-yellow and redgreen), unimodal auditory, and bimodal audiovisual stimuli with three visual conditions were randomly presented at a 12-degree visual angle to the left or right of the center. The participants were asked for responding to the presented stimuli quickly and accurately. We used cumulative distribution functions to analyze the response times as a measure of audiovisual integration. In addition, the pairwise differences and t-tests were performed in cumulative distribution functions to compare the audiovisual integration with different visual conditions. Results: The statistical analysis results indicated that the facilitation of audiovisual integration in blackwhite condition was significant larger than red-green in the early stage and blue-yellow in the later stage. Additionally, the behavioral facilitation in red-green condition was significant larger than blueyellow condition in the later stage. Conclusion: These results suggested that the different color pathways affect both the behavioral facilitation and time of audiovisual integration. Audiovisual integration, red-green visual, blue-yellow visual, black-white visual, cumulative distribution functions, color pathway.